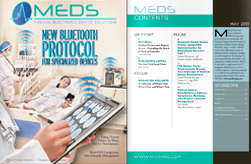 MEDS (Medical Electronic Device Solutions) is a must-read publication for the Medical Device Developers. Our vision is to cooperate with leading medical device manufacturers and community groups to educate and promote the best practices to help medical device manufacturers to develop and produce the best medical products. We would help facilitate the building of the medical eco-systems / communities worldwide. MEDS is published by the RTC Group which has 26 years of history in the embedded industry and many loyal followers. We want to invite the developers of medical electronics to be a part of the growth by working together. We would work with the leading developers, researchers, compliance agencies, companies who perform testing and consultants to search for the best design and manufacturing practices. We will share these findings with the community and the subscribers of this publication. Email us to contribute an article or to be interviewed by our editors. For 26 years The RTC Group has focused its attention on providing the most efficient, cost-effective tools for sales and marketing in the embedded electronics marketplace. We have time-tested products and services with focused and proven results. Whether you’re looking for face-to-face contact with engineers at an event, wanting to brand your company while developing leads through our publications or even looking for online advertising that is focused on your clients, The RTC Group has the marketing activities to not just create contacts but develop leads. RTC clients include the largest software, silicon and hardware vendors in the world.